Irish karaoke DVD song list: Danny Boy, When Irish Eyes are Smiling, My Wild Irish Rose, I'm Looking Over a Four Leaf Clover, Macnamara's Band, The Wild Rover, Cockles and Mussels, Black Velvet Band and The Unicorn Song. 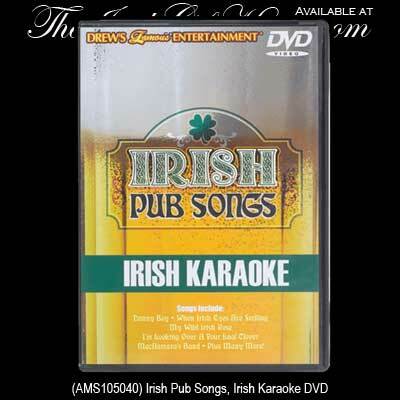 Sing along with the Irish pub song karaoke DVD on St. Patrick's Day or at your next Irish party. The St. Patrick's Day karaoke DVD from The Irish Gift House is sure to be fun for all ages.